A game... or vignette? I have no idea. 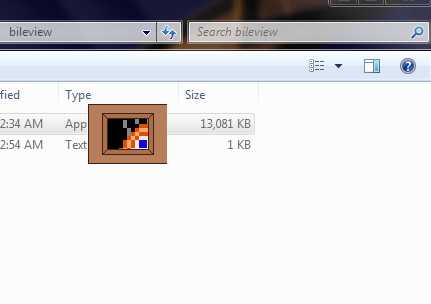 Where the game window (I guess it's a game now) becomes a small picture frame that can be moved around with the mouse. And as you move the picture frame around the screen, you will find a MONSTER that is trembling in fear at something accompanied by a cry. Or is the sound effect a taunt? Who knows??????????? Made in a day for the inaugural Nobody Except Me Knew I Was Making This But I Needed To Capture The Idea Before It Faded jam. Bileview was created in Clickteam Fusion 2.5. Art was drawn in GraphicsGale/Microsoft Paint and sound effects were recorded in Audacity. I've uploaded a new .zip that now contains the source for anybody who's interested in exploring a similar mechanic! I removed the sprites and audio from it, though, to preserve some of the sense of discovery in the game. It requires the Mouse object and Window Control object. This is such an unsettling game! And I mean that in a good way. It has a feeling of dread at what could appear next, but there is a restless intrigue in finding out what... The techniques in use here are so good. Aw, I feel bad for the little monsters, little because my screen is pretty big. I'd like to see more of this sort of thing. The designs of the monsters is great too. It reminds me of the idea of monsters in movies and how they are scarier when you don't see them a lot of the times, or so they say. I like the idea that you can never see the whole monster in this game. I do wish I could leave this game running and different monsters could show up. However, I do like that I have to really like, 'reset' the game. Something about that makes this game feel more like a physical experience, especially because of how this interacts with the user's desktop. Thanks for your review! The original idea was to have all of the monsters be available to view simultaneously, so that you would be able to find all of them in different parts of the screen, but this actually caused a glitch where if two monsters were overlapping when their positions were randomized at the start, one or more of them would kind of freak out and jump all over the place. Which was more annoying than scary. 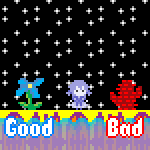 Then I wanted to make it so the player could hit a button to generate a new monster, but for some reason it wouldn't re-randomize their position. And that didn't seem very interesting, to just spawn a new monster in a place where the player was already looking. So then I settled for "one monster at a time, you have to restart to try to get a new one." As someone who can get majorly sidetracked by feature creep or letting tiny problems become big ones, it was kind of nice to just... let it go. Interesting things can happen when your game partially designs itself haha. Thanks again. I've had that idea myself. :) Or leaving it on a thumbstick somewhere.